Hi! I just returned from my weekend at RustFest (the European Rust conference) in Zurich. 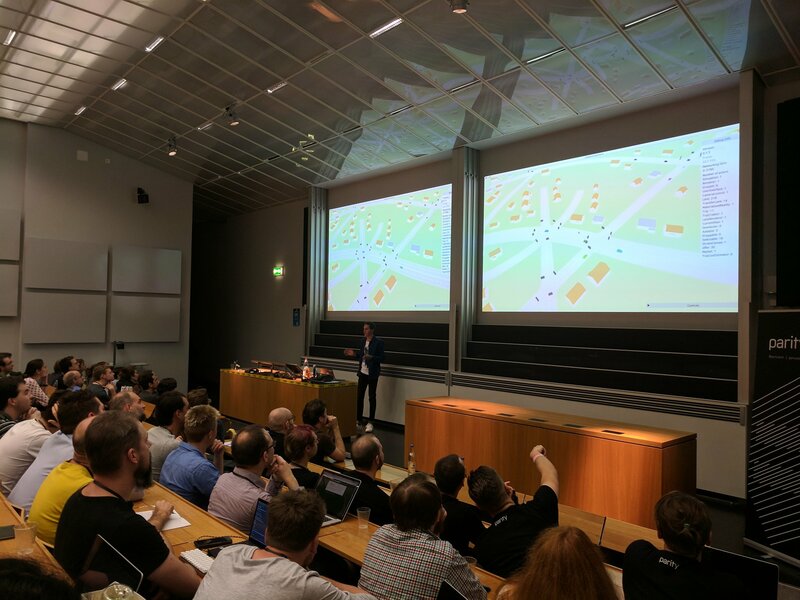 As I mentioned in my last blog post, I came there as a speaker to present Citybound and some of the under-the-hood goodies of the engine to a lecture hall full of fellow Rust developers. I felt like my presentation went really well, including spawning 100,000 cars and the very risky first-time realtime-multiplayer-over-WiFi demo - I even managed to add simple buildings again shortly before, just to make everything a little prettier. The crowd seemed pretty impressed, and I can't wait to show the demo to you as well - I already asked the organisers, they said that the recorded talk would be published "soonish". I also got to know some "Rust celebrities" and a ton of interested, friendly people. If you're one of my new followers, it was a pleasure talking to you, please meet my community! I will probably do another more detailed post about my experience there once the presentation video is available. This also concludes (for now) my sprint on the networking prototype. On the train ride back, I was already working on the economy again! As always, I will post the join-as-caller link to all Patrons on Patron ~10min before it starts.